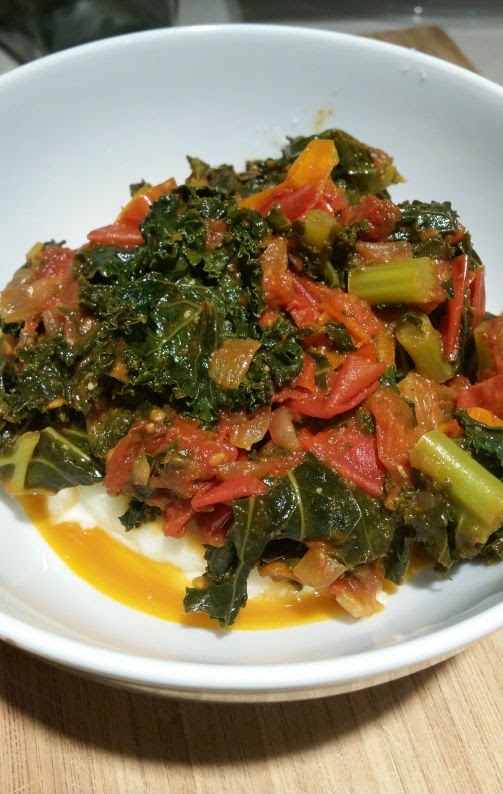 Recently, while looking for new recipes to try, I came across a Kenyan dish called Sukuma Wiki (braised greens with tomatoes). While you may not have heard of the name, I’m pretty certain you’re well acquainted with the ingredients. The name of the dish means “to push/stretch the week” and the dish is suited just for that purpose. It is a dish you can eat alone or mix with other ingredients to stretch your groceries for the week. It’s also super affordable and delicious. Chop the kale into rough 1-inch pieces, including the ribs. Roughly chop the tomatoes. (If desired, reserve about 1/4 cup fresh tomato pieces for garnish.) Peel and dice the onion. Heat the oil in a large, deep pot, or a large wok. When it is hot, add the onion and cook for about 8 minutes over medium-high heat, stirring frequently. When the onion is getting soft, stir in the cumin, coriander, and turmeric. Stir in the tomatoes and cook for about 2 minutes. Add the greens one handful at a time, stirring constantly to coat them with the onions, oil, and spices. When they have all been added, sprinkle the salt and a generous amount of fresh pepper over them and stir. Remove the lid, turn off the heat, and toss the greens with the lemon juice. Serve hot, garnished with extra tomato, if desired. I served the dish over creamy mashed potatoes and it was perfection for my palate. I also think it would go well with farro, quinoa, brown rice, couscous, polenta or grits, etc. Pretty much any grain will work. You can also serve it with ground meat (which is a bit more traditional) or vegetarian crumbles. Ash had it with some shredded chicken he had from a meal the night before. Essentially, the dish goes well with whatever you choose to serve it with. Experiment and enjoy!